I started using Primal Pit Paste in February of 2015. February seemed like a good time to dive into the switch because it would be cooler and I could hopefully adjust to sweating slowly. Every day of the first week I thought about going to the grocery store and picking up my normal antiperspirant. Every. Single. Day. That first week I sweat so much. I had pit stains on my shirts and smelled like I hadn’t showered. It was bad enough that I skipped the gym because I was nervous of how I would smell while working out. Luckily, I was busy that week and didn’t have the time to swing through the grocery for the old antiperspirant. By the middle of the second week my body had adjusted. I had a mild scent of lavender (the Primal Pit Paste scent I chose) and I was sweating less. I was back in the gym, and I still didn’t smell. It was miraculous. The one down side of the Pit Paste is its availability. I had to buy it online or at Whole Foods, not particularly convenient if you are like me and Whole Foods isn’t your regular market. My second test product happened out of convenience. At the grocery store one day I remembered I was low on deodorant. I checked out the natural options available and Nourish Organic seemed to be the closest thing – I was swayed by the pretty packaging. That plus the fact that it is billed as a natural antiperspirant. Big mistake. The stick rolls on grainy, like painfully grainy. The primary ingredient in this stick is beeswax, probably to block your pores, but for me it cause some pretty serious irritation. I noticed recently that they have rolled out a gel version of their product which may address some of these problems. Needless to say, I stopped using it immediately. I went a couple of days without any product on (something that would not have been possible if I had been using my old antiperspirant up until this point) and it cleared up. I decided this was my golden opportunity to try out a deodorant crystal. I really enjoyed using the crystal all the way up until it started warming up again. It was very effective in the cooler months. For it to work once the heat started coming back I needed to reapply 4 or 5 times a day. I did find that if I combined the crystal spray and the crystal, it was a little better. I didn’t not like the crystal, and it is super cost-effective, but I decided to keep testing. The next experiment was Piper Wai. Piper Wai had been on my radar for a while, but I had been a bit turned off by the idea of applying deodorant with my fingers. I decided it was worth a shot and ordered a container off amazon. Pro tip: always order directly from the Piper Wai website. They were out of stock when I placed my initial order, which is why I went with amazon, but I ended up paying like $8 more for the product. I got over the whole applying the product with your fingers thing after the first use, the stuff is amazing. Going in, you have to remember that you are going to sweat – this is not an antiperspirant. Sweat does not equal smell, though. What I have learned in the last year of trial and error is that once you have weened your body off antiperspirant it begins to self-regulate better. I am a pretty sweaty person and I rarely have sweat stains anymore (even during the crazy heat waves we had this summer.) Beyond that, I am at the point where the only time my sweat actually smells is if I have been eating poorly. Overall, I give Piper Wai a 5 out of 5. 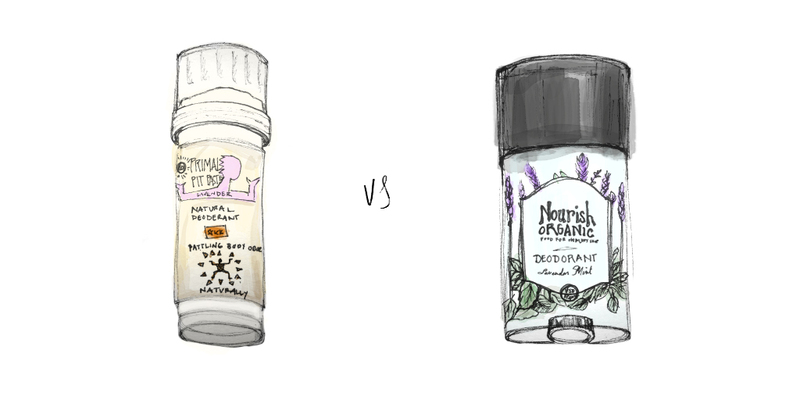 If you are looking for a natural deodorant that is 100% the one I recommend. I might have to wait until fall to try this, but I’ve been thinking about abandoning my super-aluminum deodorant for a while. Thanks for the rec! Hey girl! Have you tried Lush products? I’m a big fan, the deodorant I swear by ever since I discovered this brand is called Aromaco, test it out for yourself ? Nobody can resist those bath bombs ! ?? That’s so good to know about them selling at GNC if I’m ever in a pinch! After trying a second natural deo that literally made me smell like dirt (no joke, like top soil), I discovered Piperwai. I really like the scent. It doesn’t quite get me through the work day in the summer, but I’m definitely going to use it during the cooler months. I also really like Meraki Botanicals Sage Orange deodorant. This one doesn’t get me through the day in the summer either, but I’ll use it in the cooler months. Unfortunately, I ended up switching back to my drug store antiperspirant for the summer because I was sweating ridiculously (something I could have dealt with) and smelled halfway through the workday to the point where I would try to use perfume to cover the smell. I work in an office with A/C where I literally sit at my desk for 8+ hours a day. Long story short, maybe it’s my poor diet that is contributing to natural deodorants not working so well for me. Maybe I’ll give Primal Pit Paste a try. Thank you for weeding out 2 deodorants that I won’t bother trying. ?? Good luck on your search!! !